Captain Jim's is a beautiful three story home decorated in a nautical style with three bedrooms and a loft and a family room with futons with spectacular views from all three levels. Enjoy your time here watching the boating activity at the marina or just looking at the beautiful water, mountain and island views from inside or one of the many decks outside. Be sure to watch for the deer and bunnies that come to visit in the backyard or wandering down the street! Just minutes away, you can shop in historic downtown Anacortes or take a whale watching tour from Cap Sante Marina. 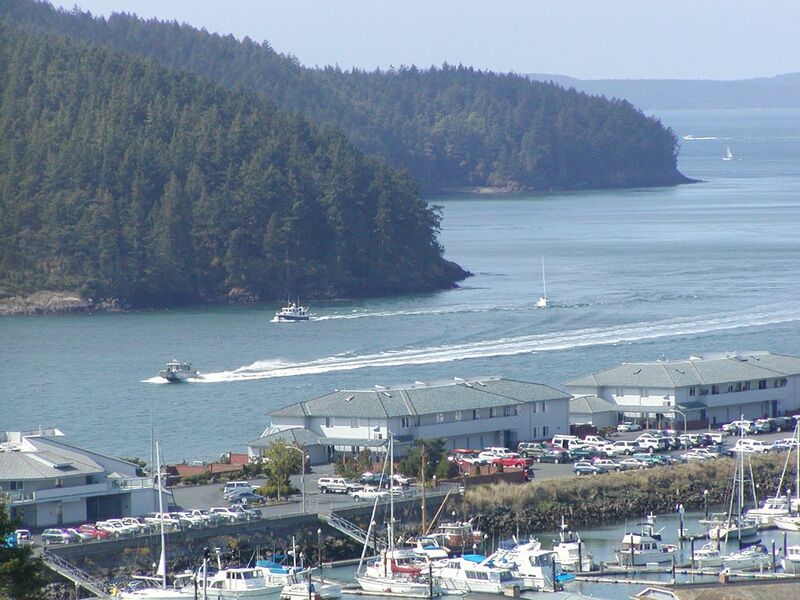 You could also hop the ferry for a day trip to Friday Harbor. The Captain's House overlooks Skyline Marina, Rosario Straights, Burrows Bay & Washington Park. Spectacular views of the mountains, islands and marina activity. -Walk to Tugboat Park and Beach. -Drive 1 minute to Washington Park and enjoy 220 acres looking over Rosario Straights, with a beach, lookout points and picnic tables for walkers or drivers. There is a boat launch with covered picnic tables & play area for kids and adults. - Take a guided kayaking tour from Skyline Marina. -Take the 'Ice Cream Cruise' to Friday Harbor aboard the Paraclete Charter Boat. -Go whale Watching out of Cap Sante Marina only a 5 minute drive into town. -Pack a Picnic lunch and drive a short distance to Mount Erie Lookout and enjoy the spectacular scenery. park for $10.00and walk aboard for a gorgeous cruise through the San Juan Islands to Friday Harbor for the day. There are lots of shops and restaurants. _Hop on the local bus just up from the Ferry and get a narrated history of the island. It takes you to the Pelindaba Lavender Farm, Lime Point & Lighthouse for a hike and a picnic. There are picnic tables with great views- and if you time it just right you will see the whales in their feeding ground. From there the bus continues to Roche Harbor where there are restaurants and vendor booths and historical sites to see. A great trip! -You'll probably need a week to do all the fun activities that are available in the Anacortes area. Unlike other islands, you are not stuck on this island, but can go easily to any of them! COME FOR THE HOLIDAYS!Enjoy the decorated house, Christmas Tree & huge counter for your cookie baking & visiting with friends and family. The dining table opens out for large gatherings. Excellent house with beautiful view, functional kitchen and plenty of space. We had a great time over Christmas in this house. The kitchen was well stocked and we were able to prepare and enjoy a turkey dinner for the family. I would highly recommend this house for any family gathering. This is a great place to stay. The hosts are wonderful. Amazing views, great amenities and comfortable beds. The kitchen is fantastic! What a bonus to find a sauna off the back porch too! We can't wait to stay here again. Thank you for the wonderful time! Had a great Thanksgiving at Captain Jim's with a family group of 8. Everyone had a place to sleep and chill out, plus the communal areas were big and comfortable. Views are just amazing, even from the lowest floor! Kitchen was well stocked; we were particularly glad to find a turkey roaster. Thank you!!! The house was very clean and the kitchen well appointed. Comfortable beds in each room and plenty of towels in each bath. Panoramic view of the harbor, Puget Sound, and the Olympic range in the distance was/is spectacular. Beautiful home with an amazing view. Conveniently located to the Ferry and easy drive to Annacortes. Upon our arrival, we did have a disappointment. The house had not been cleaned. We immediately called Elisabeth and she was very quick to respond. She arranged for us to go to dinner on them, while she had a cleaning crew come in. During dinner, we received a phone call to inform us the house was ready. When we returned to the home, only the main level had been cleaned. The upstairs loft area had not been vacuumed. The lower level bathroom and floors had not been cleaned. This left us feeling very uncomfortable. We reported the issue the next morning. Some notes were made, but nothing further was done about the cleaning. It's unfortunate this happened on our vacation. Hopefully new cleaning crews have been hired. It really is a gorgeous place/area to visit and we would love to come back some day. Stunning views and House is well equipped, had everything we needed. Being able to bring our beloved 11 yr old dog made it over the top. Our daughter and son-in-law live here and we were able to have dinner at the house every night with them and several of their friends, built fire in fireplace, and had relaxing and fun times with family and friends. Thank you for sharing your wonderful home with us.